The Jewellery Quarter BID (JQ BID) is encouraging local jewellers to sign up to an apprenticeship scheme that aims to create the next generation of skilled craftspeople. 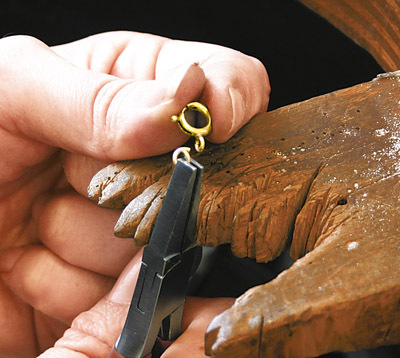 The School of Jewellery is working in partnership with Holts Academy in London, the British Jewellers’ Association (BJA) and Birmingham City Council to offer young people, aged between 16 and 24, the opportunity to learn traditional craftsmanship skills in a real working environment while also working towards an industry recognised qualification. Six businesses based in the Quarter – including Toye, Kenning & Spencer, and Magnus and Bella – have already signed up to take on an apprentice next month (March). Students will work towards achieving a fully accredited apprenticeship qualification in Jewellery, Silversmithing, and Allied Trades. Training will be administered by Holts Academy while the School of Jewellery will deliver the ‘day release’ learning, which constitutes 20% of the time. The course includes a module covering IT and numeracy as well as more specialised elements exposing apprentices to skills such as enamelling, stone setting, and hand engraving. Birmingham City Council is keen to support this initiative in order to create employment and sustain the skill base in the Jewellery Quarter. It will fund a wage subsidiary to support a proportion of the apprentice’s wage for two years.